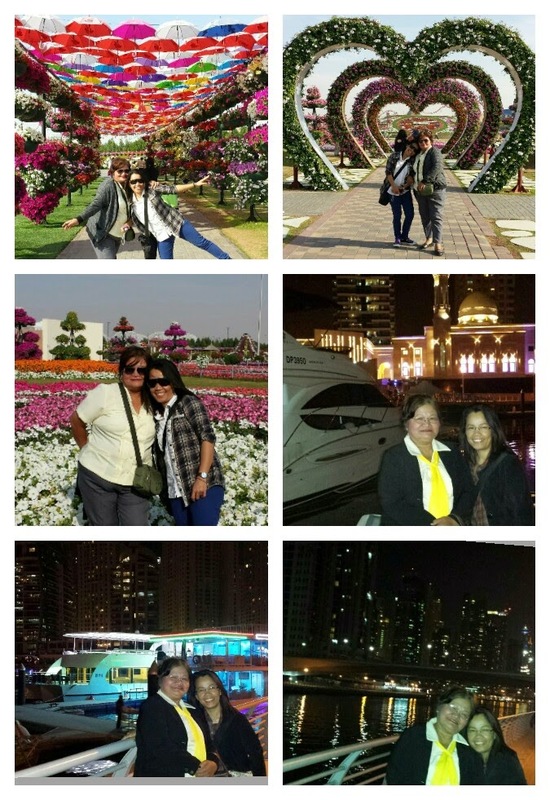 Last 24th of January (I know this is a very late post), my mother and my sister visited me here in Dubai. My mom flew in from Manila while my sister was from Bucharest. It was a one week vacation for them and also, it was a part of my birthday celebration here. I had to leave them on their first day since I had a church activity so they just roamed around the area near my apartment and spent some time in Mall of the Emirates. The next day, we went to Abu Dhabi. It was a tour from an agency so the transportation was easy. 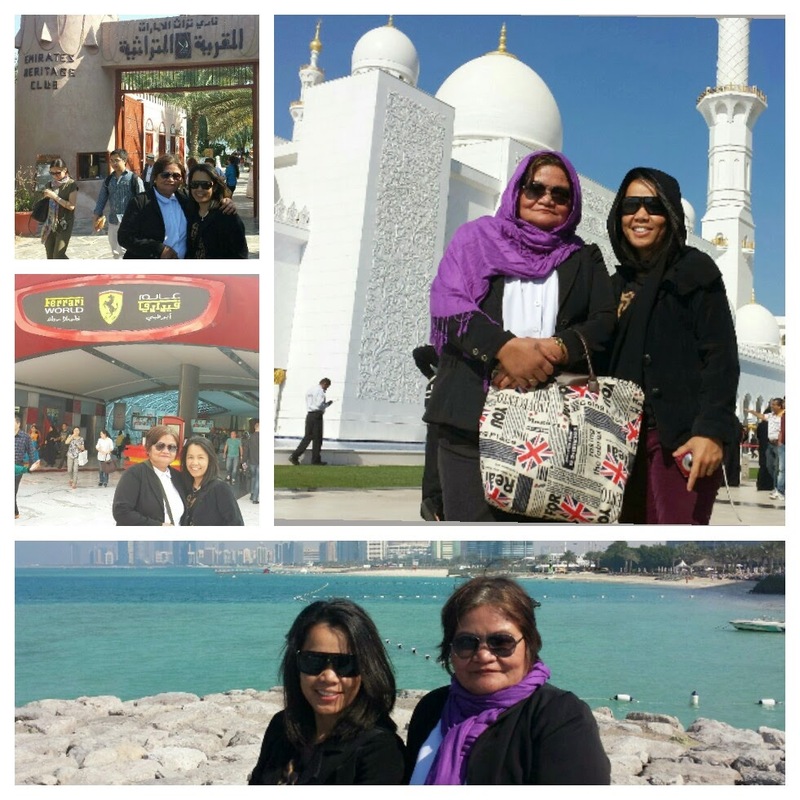 We went to Grand Mosque, Corniche, Heritage Village and Ferrari World. It was a whole day event. The minibus also took us to some landmarks in Abu Dhabi including the Emirates Palace, residence of the Sheikh and dates market. We had our lunch buffet inside the heritage village and we bought some souvenirs. We visited the Miracle Garden on their third day. It was my first time visiting that place and I was amazed by the numbers of flowers (maybe that's why it was called miracle garden) they had. The entire place was colorful and the designs they created were really nice. I believe this garden is open only during winter as it is impossible to maintain it during summer when the heat of the sun is superb. Later that night, we had a Dhow Cruise around Dubai Marina. Our buffet dinner was also served in that cruise. It only took around two hours to navigate the surroundings of the marina. On their fourth day, we spent our time in the Global Village. It was also my first time there and also opens only during winter. It is a place where different cultures from several countries were displayed and exhibited. There were several areas and booths where you can experience a bit of each country's customs. It is a very big area and my mother got tired. There were also some stores and food counters so we tried some of them. My sister and I bought some perfume (it was on sale) and souvenirs to be sent to Manila. Sharjah and Ajman were our next destination. Unfortunately, my mother chose to rest as she was so tired and insisted to stay at home. So my sister and I got into a tour of the said emirates (it was also my first time). 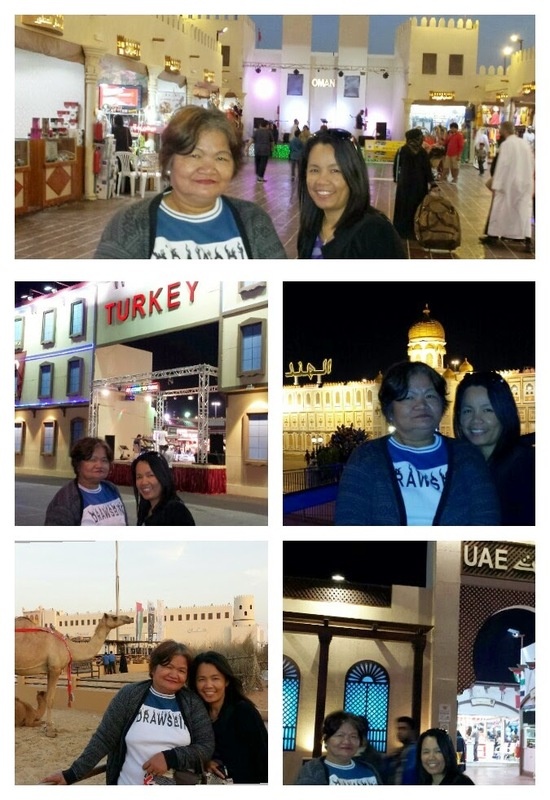 In Sharjah, we visited the Gold Souq where we bought a necklace with cross pendant. We also made a stop in a beach and rested for a while. 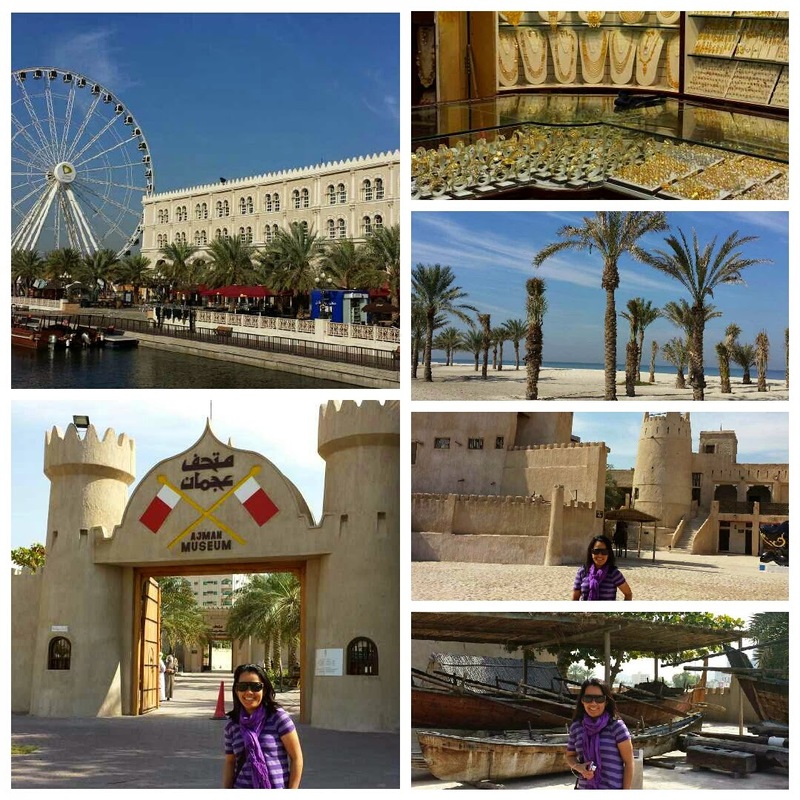 In Ajman, we visited their famous museum. 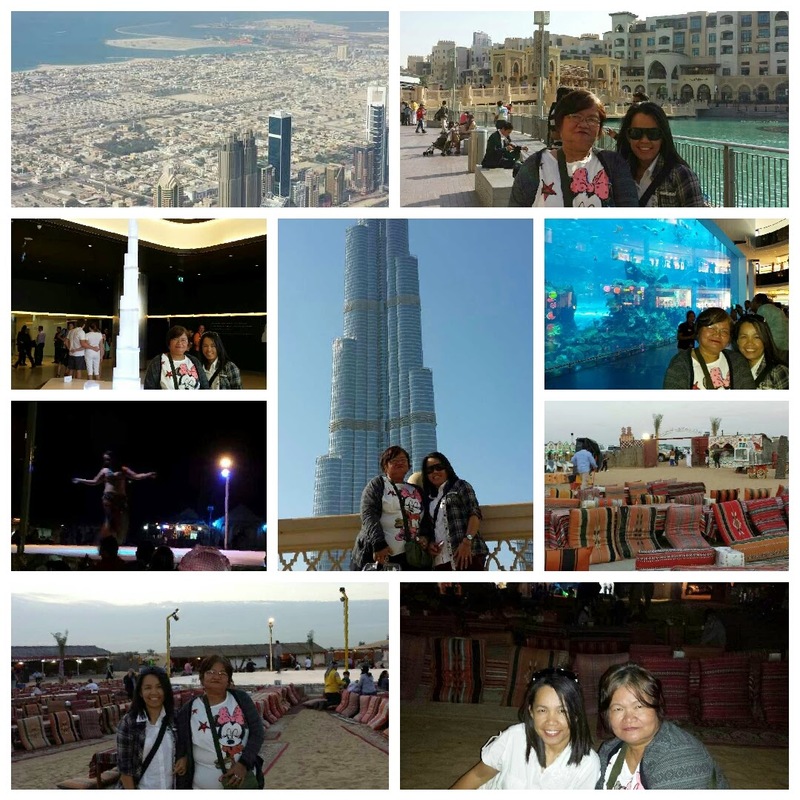 Day number six was a visit to the world's tallest building, the Burj Khalifa. We went to the top of the building where we saw the majority of Dubai land. It was my second visit there; the first was with my father. After that, we had a quick visit around Dubai Mall and checked some stores. From there, we were picked up by tour agency that brought us to the Desert Safari. We just had our buffet dinner there and watched some performances (including belly dancing). 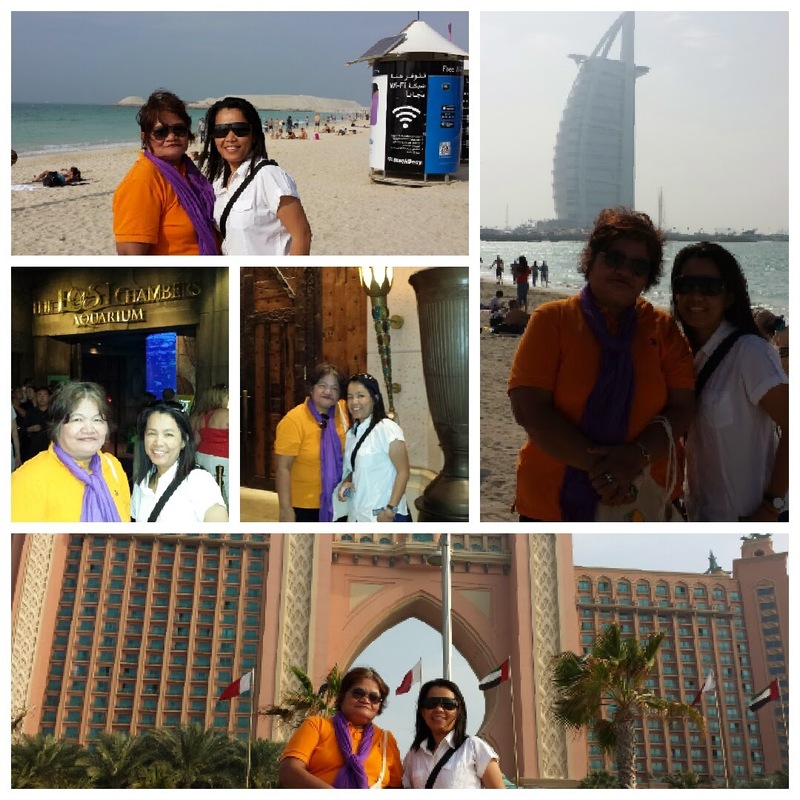 On their last day, we were able to squeeze in a quick visit near the Burj Al Arab (the only seven star hotel in the world) and in Atlantis. We went to the beach around the area and took some photo. Later in the afternoon, we drop my sister at the airport as she had an earlier flight than my mother. Then in the evening, my mother and I went to the airport, we had the same time of flight. She is returning back to Manila while I was heading to Muscat. It was a great and memorable experience spending quality time with them. Though it was short, it was still meaningful and my birthday week became better.